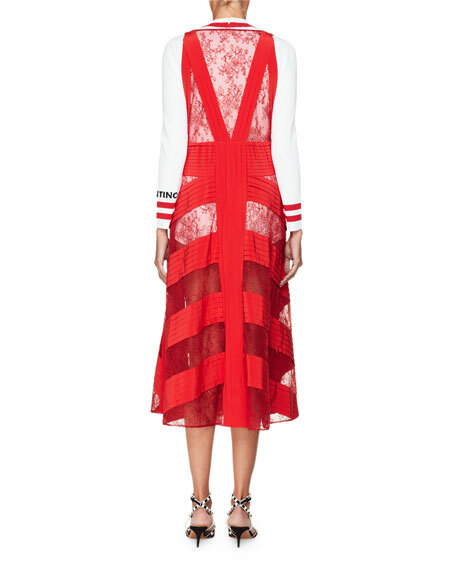 Valentino daisy-lace dress with pleated panels. A.L.C. "Morrow" dress in viscose jersey. V neckline. Long sleeves. A-line silhouette. Asymmetrical hem. Midi length. Slipover style. Viscose/polyester. Dry clean. Imported. Model's measurements: Height 5'10"/177cm, bust 33"/84cm, waist 25.6"/65.2cm, hips 35.8"/91cm, dress size US 2-4/FR 34-36. CALVIN KLEIN 205W39NYC dress in compact wool-mohair boucle. Contrast popcorn lace trim. V neckline. Sleeveless. A-line silhouette. Knee-length. Virgin wool/mohair/nylon. 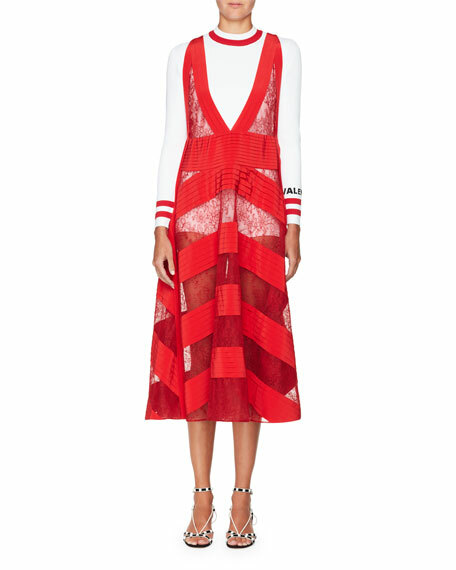 CALVIN KLEIN 205W39NYC dress in compact wool-mohair boucle. Contrast popcorn lace trim. V neckline. Sleeveless. A-line silhouette. Knee-length. Virgin wool/mohair/nylon. Made in Italy. Model's measurements: Height 5'10"/177cm, bust 34"/86cm, waist 24.5"/62cm, hips 35"/89cm, bra size 34C, dress size US 4. Carolina Herrera dress in floral print poplin. V neckline. Sleeveless. Fit-and-flare silhouette. Pleated skirt. Knee length. Cotton/spandex. Lining, acetate/cotton/spandex. Made in USA of imported material. Model's measurements: Height 5'10"/177cm, bust 33"/84cm, waist 25.6"/65.2cm, hips 35.8"/91cm, dress size US 2-4/FR 34-36. Fame and Partners "The Vicente" pleated georgette gown. Plunging V-neckline; open sides and back. Sleeveless; wide straps. Belted waist with buckle. A-line silhouette. Full-length hem. Slipover style. Polyester self/lining. Dry clean. Imported. Model's measurements: Height 5'10"/177cm, bust 33"/84cm, waist 25.6"/65.2cm, hips 35.8"/91cm, dress size US 2-4/FR 34-36.